Hard-driving Go-go drummers in front of the J. Edgar Hoover Building and a wiry guy in front of Trump Hotel holding a sign which read “Insecure Small-Penised White Guys for Trump!! !” were just some of sights—protesters and photo-ops at once— that hundreds of thousands of protesters saw as they entered the March For Our Lives in Washington, D.C. earlier today. Comparable in size and conviviality to 2017’s massive Women’s March, The March For Our Lives—organized after the Marjory Stoneman Douglas High School shooting in Parkland, Florida—was nearly festive at points with feel-good songs (Bob Marley’s ‘No Woman, No Cry,’ and ‘If You’re Happy and You Know It’) blasting from speakers and signs that were often witty, angry, or both—most popularly, “Never again,” and “We call B.S.,” the latter what Stoneman Douglas student turned organizer Emma Gonzalez declared in a speech just days after the Feb. 14 shooting that killed 17 and wounded 17. Among those out today was Nora Ludden, a survivor of the 1992 Simon’s Rock shooting, in which 18 year-old Wayne Lo, a student at Simon’s Rock College of Bard in Massachusetts, murdered two people on campus and wounded four after purchasing a semi-automatic rifle at a sporting goods store. Lo, the Simon’s Rock shooter, currently serving two life sentences without parole, has commented himself on how the easy availability of a weapon and the lack of a two-week waiting period enabled his 1992 shooting. Ludden is one of many Simon’s Rock alumni who signed a petition demanding “more access to mental health services and less access to weapons” following the Newtown, Connecticut shooting. The Newtown shooting happened exactly 20 years after the Simon’s Rock shooting—Dec. 14, 2012 and Dec. 14, 1992. It could very well have been understood as an anti-N.R.A. rally, with a focus on the gun rights lobbying group turned overbearing death cult and all of its adjacent issues such as the Trump administration, access to AR-15s, and the ways in which money has deeply compromised American politics and halted the possibility of gun control. 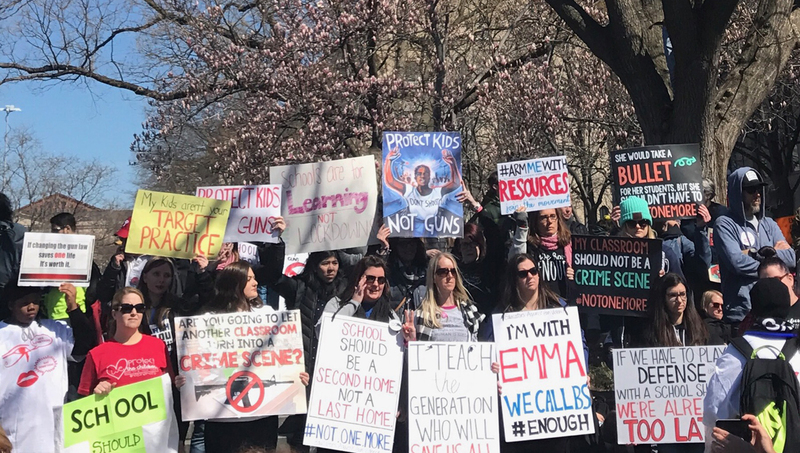 And while the story about the march leading up to it has focused on school shootings, Parkland activists such as David Hogg, have called attention to gun violence in cities such as Baltimore and Chicago, invoked “white privilege” and stressed the difference between how Parkland was covered and how violence in communities of color is covered. When Hogg addressed the crowd at the march, he focused on politicians who take money from the N.R.A. (particularly Marco Rubio, Senator from Hogg’s home state of Florida) and mobilizing first-time voters. While many of the Parkland students turned organizers and famous activist faces—currently on the cover of Time—such as Hogg and Gonzalez (who led a six-minute moment of silence) spoke, Edna Chavez, a South Central Los Angeles resident and member of an L.A. Social justice organization called Community Coalition, delivered the strongest dose of real talk. She underlined the march’s message but also challenged some of its assumptions, and paid tribute to her brother, Ricardo, who was shot and killed. “You hear a ‘pop’ thinking they were fireworks, they weren’t—you see melanin on your brother’s skin turned grey. Ricardo was his name, can y’all say it with me?” Chavez said. “Ricardo” was shouted and his name traveled through the crowd in waves. Chavez cut through some of the saccharine formalities of such a massive, nationally televised march, with a passionate, at times poetic speech and connected school shootings to inner city gun violence in a way that Parkland’s students who admittedly, had not experienced the latter never could. Chavez explained how putting more police in schools was not a solution—in direct conflict with some Parkland messaging (The Guardian recently published, “Our manifesto to fix America’s gun laws,” written by the staff of the Marjory Stoneman Douglas High School newspaper and among the demands is to “Increase funding for school security”). The March For Our Lives ended with a gospel-tinged take on Bob Dylan’s ‘The Times They Are A Changin’ from Jennifer Hudson, though it was a performance earlier in the day from South Side Chicago rapper Vic Mensa that more artfully and fervidly paired performance and protest. At that moment, everything that had been hovering in the background of the March For Our Lives was finally, briefly, pushed into the foreground.